At least 10,000 spectators are expected to flock to a "spectacular" dragon boat festival in Leith this summer. The Dragon Boat Challenge, expected to be the largest of its kind ever held in Scotland, will feature up to 50 boats, each 40ft long. More than 1,000 participants are to take to the water in Western Harbour for the 5 June event. Leith Rotary Club, organising the day-long festival, hopes to turn it into an annual event to raise £100,000 a year. Up to 50 teams can enter with 20 allowed in each group. It will take place a day before the annual Dragon-Boating Festival, which is celebrated as a holiday in China. 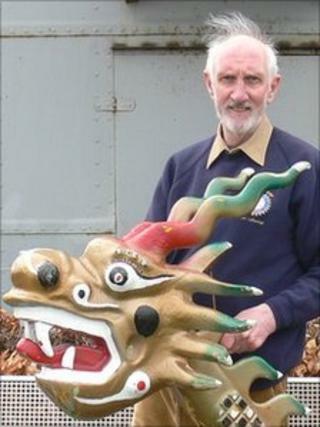 Cron Mackay, president of the The Rotary Club of Leith, said the idea came when members attended a conference in York last year and went along to the city's own Dragon Boat Race, which has been successfully running for eight years. Mr Mackay said: "The event in York has raised over £500,000 for charity but the Dragon Boat Events company told us we could do better because we have a much better venue here than York's river situation. "We are hoping to make £100,000 a year. "This promises to be a truly spectacular event with stalls, a tented village and local bands to complement the racing." The races will run parallel to Ocean Terminal shopping centre. Applications for the event will be taken until the end of April and cost £500 per team. The minimum age for participants is 16 and all team members must be able to swim.